I’ll be the first to admit, I love a good cheeseburger. I know it is grilling season and all, and trust me I love a great burger cooked over charcoal, and I especially have been loving the smash style burgers on a cast iron skillet, but some times you just need to change some things up a bit. I’ll be the first to admit that I typically do not plan what I am going to cook for my family on a daily basis either. A challenge for me? Maybe. Or maybe it is just that I want to eat what I am in the mood for, or simply going off that idea of a ‘Chopped Challenge’, looking through my mystery pantry and refrigerator to come up with new ideas. 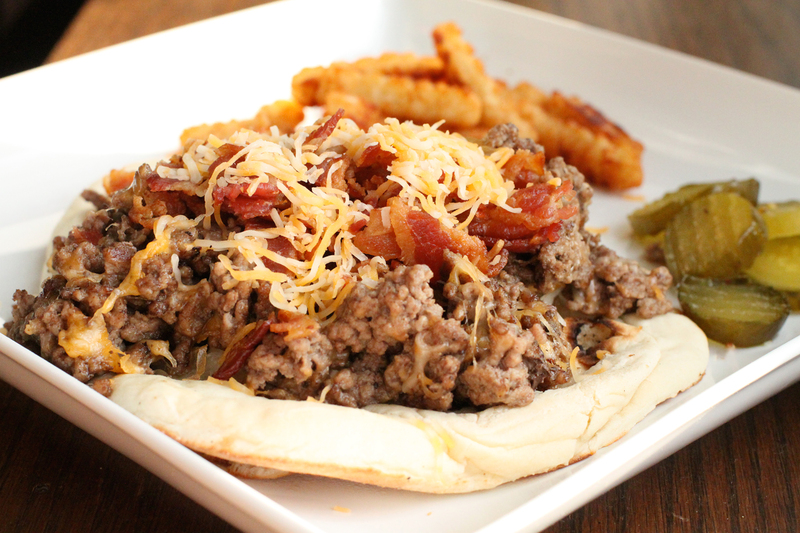 This is one of those ideas, and as simple as it was, it turned out to be really delicious, and ultimately a new take on that classic cheeseburger. Let me also admit that one of my favorite burgers right now consists of cheese, bacon, of course, caramelized onions, and pickles. For some odd reasons, I cannot get enough of pickles when it comes to a cheeseburger lately. Start by preparing all of your ingredients. In a large skillet, add the ground chuck, and cook until nice and brown. Drain any of the fat. Add half of the shredded cheese to the ground chuck, give a good stir, and let that melt. Season with salt and pepper. Prepare your flatbread by adding the warmed Naan to your plate. 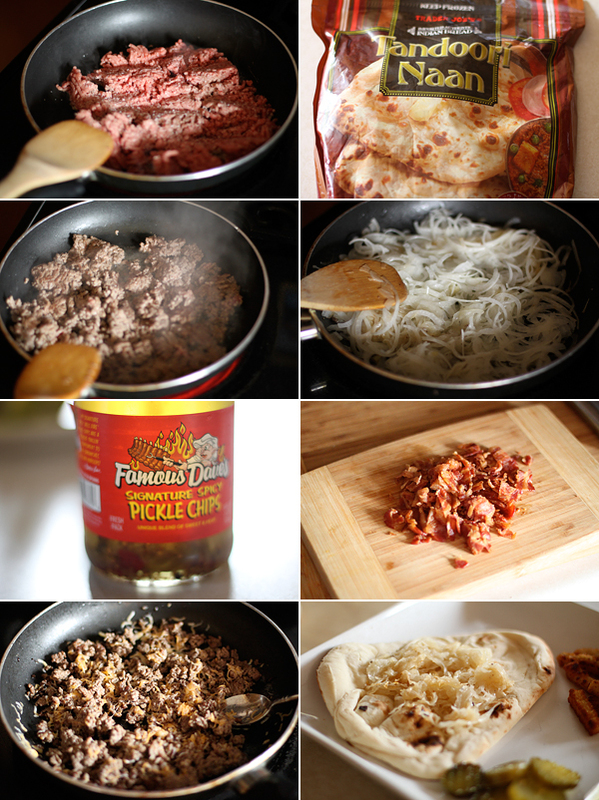 Add the cooked caramelized onions to the bottom of the flatbread, then add the cooked ground chuck on top. top with the crumbled bacon, and get ready to dig in. Now if you love a good flatbread, you have a couple of options. Fold and chow down, or heck, go in with a fork and knife. Whatever the case, the sweetness of the caramelized onions, along with the smokey bacon, and the tanginess from the pickles really make this sandwich a nice little twist to a classic cheeseburger on a bun. I hope you enjoy.